Last week we brought you the story of SNIPE a really fun kickstarter campaign that bridges a physical game with an app. 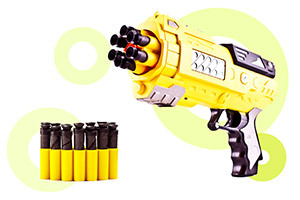 With SNIPE you get a gun that looks similar to a nerf gun with soft foam bullets. These bullets are optimized for their “softness” and to trigger actions when they hit an iPad screen. It seemed like a lot of fun and was created by the same team that made sword style styli to play Fruit Ninja. The team at XnTouch is serious about fun and games. Their Kickstarter pitch video is hilarious but resonates with the gamer in all of us who misses either a good first person shooter or an arcade style shooter game like Duck Hunt or Deer Hunter. The founders of XnTouch have seen for themselves that as mobile games exploded less and less of these types of games were available. In their place are Dots, Threes, and Candy Crush. That’s why they created SNIPE. But now the latest Israeli conflict is hitting way too close to home. It’s sad and unfortunate that the immensely talented developers and designers in Israel have grown up dealing with missiles, bombings and machine guns as just part of everyday life. It takes a lot to jilt Israeli entrepreneurs. Don’t believe us? In November of 2012 it took a missile attack just 12 yards away to finally halt a Startup Weekend. Cliquist.com reports that the current conflict is getting increasingly serious. “Things have come to a head in Israel recently, after the kidnapping and murder of three Israeli teenagers in the West Bank things have gone from bad to worse. Right now, airstrikes and rocket attacks are a seemingly daily occurance. Talks of peace seem to be quite unlikely at the moment. People on both sides of the conflict are spending their days living in fear and danger that words cannot sufficiently communicate” the site reports. With those factors in play the team at XnTouch has decided to suspend their Kickstarter campaign that was well. As some of you probably know, our company – XnTouch LTD – is an Israeli company, based both in Tel Aviv and New York City. Therefore, the current situation between Gaza and Israel has a direct affect on each and every one of us. In the last 6 days, since the conflict has escalated, we weren’t able to work properly. It was impossible for us to respond to all of our costumer’s inquires, reach out to media coverages, and power this campaign towards success. Some of our employees that lead this Kickstarter campaign were under a lot of pressure due to the rocket attacks and tensed atmosphere. Unfortunately, as you can see, this crazy situation that was forced upon us caused us to abandon our marketing plan, which leaves us with no time to reach SNIPE’s funding goal, especially with a partial men-power. We have no choice but to cancel this specific Kickstarter campaign in the next couple of days, but that doesn’t mean that SNIPE won’t become a reality! We plan to regroup, reevaluate, and prepare ourselves for a relaunch! At the same time we’ll work around the clock to improve the SNIPE gear and game features, in order to create a one-of-a-kind gaming experience. XnTouch successfully funded SliceSword the interactive Fruit Ninja stylus and the company was ramping up for a big finish with SNIPE before deciding to halt the campaign. Right now we hope that the XnTouch crew can stay safe and we look forward to seeing SNIPE when it makes it back out to market.